Damien Lucas began his study of drawing with the late David Wilson in Bathurst in 1997. Wilson then introduced him to master sculptor Tom Bass, which lead to the full time study and practise of sculpture. He also completed his Bachelor of Fine Arts at National Art School, Sydney, in 2004, and received the Defiance Award for Excellence in Sculpture. He is well versed both in classicism & modernism in the figure and abstraction, working in a variety of mediums including clay, plaster, stone, wood, steel and bronze. He assisted Bass on several of his commissions as an apprentice, absorbing much of Bass' life time accumulation of knowledge of sculpture and drawing, and eventually took the role of principal teacher at the Tom Bass Sculpture Studio School in Sydney. He has shown work in both group & solo exhibitions throughout NSW & his recent commissions are situated publicly in Longreach QLD, Cootamundra NSW, Mittagong NSW, Sunbury VIC and Orange NSW. He taught sculpture & drawing at the Tom Bass Sculpture Studio School, Erskineville from 2001-2009, Catavento Studio, Bowral from 2002-2009, Willoughby Arts Centre, Willoughby from 2008-2009 & has also taught at Fern Creek Studio, Warriewood NSW, & Jody Pawley Studio, Drummoyne NSW. 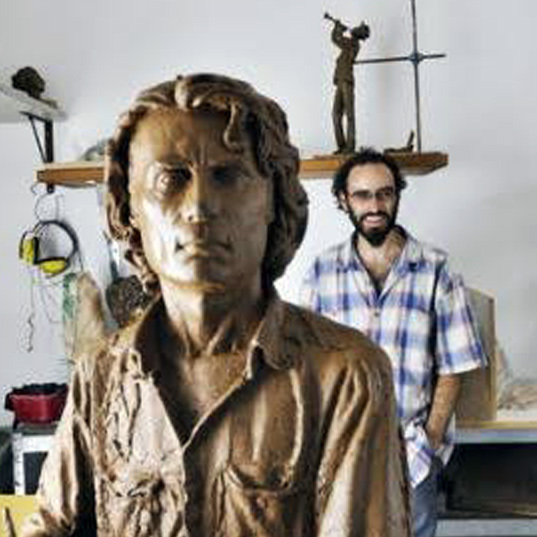 Since relocating to the Northern Rivers of NSW he co-established and taught at Myocum School of Sculpture from 2010-13. He was employed as a Foundry Technician at Crawford’s Casting, Art Foundry, Belfield, NSW from 2006-2007. Currently Damien conducts private classes and works at Damien Lucas Sculpture Studio, Byron Bay.